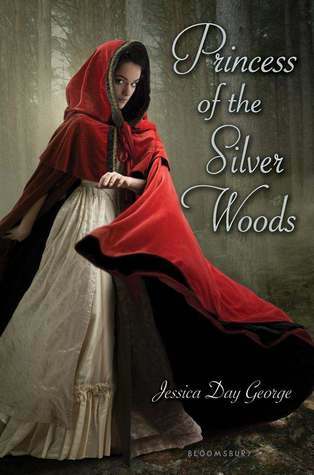 Princess of the Silver Woods is the third book in the Princess series by Jessica Day George. In each of the previous books, the author has highlighted a specific daughter and tells the story through their viewpoint. This third book follows the story of Petunia, the youngest of the 12 sisters. In the first book, Petunia is only a young child, so it is interesting to see her grown and relating to her family in a different way than previous books. As in the other books, the author is inspired by fairy tales to tell the narrative. In Princess of the Silver Woods, George takes elements of Red Riding Hood and Robin Hood to tell her story. I will say that in this story, compared to the other two- there seems to be less influence of these fairy tales. It may be that trying to take the story of Red Riding Hood literally into a more adult story is difficult. I saw the elements there, but other than her scarlet cape, it was not as obvious. I enjoyed this story as much as I did the others. I will say though, if you start this story and haven't read the other two books- you may not enjoy it as much as you should. You really miss out on who the characters are and why they are making the decisions they do. The author does not waste time retelling the back story of the previous few books- it is assumed you will have read them. As someone who did read the rest of the series, I appreciated that. The romance in this book was sweet and it was up to the standard that I expect of this author. This is by far one of my favorite fairy tale retelling series and I can't wait to see what is coming next from this author. She has proven that she can stand toe to toe with other fairy tale re-tellers like Gail Carson Levine. I loved this book as much as the others. I did wish that the fairy tale elements had played a larger role, but I was satisfied with the end result. Wonderful review!